China Glaze Smoke And Ashes // Orly Boho Bonnet // OPI Sparrow Me The Drama // OPI My Private Jet // China Glaze Sea Spray // H&M Looks Great On You // Zoya Neeka. Although I'm usually all about pastel nail polishes, there's just something about Autumn that makes me wan to switch things up. I'm still sticking with some pastels like OPI's Sparrow Me The Drama, one of my favourite pink polishes, and a couple of light blues with hints of grey. One polish that I had completely forgotten about until I was putting this post together is OPI's My Private Jet. It's a brown holographic shimmer which is really unique and although it's not as good as the original MPJ, it's still a really pretty polish and one I'll be wearing a lot over the next few months. 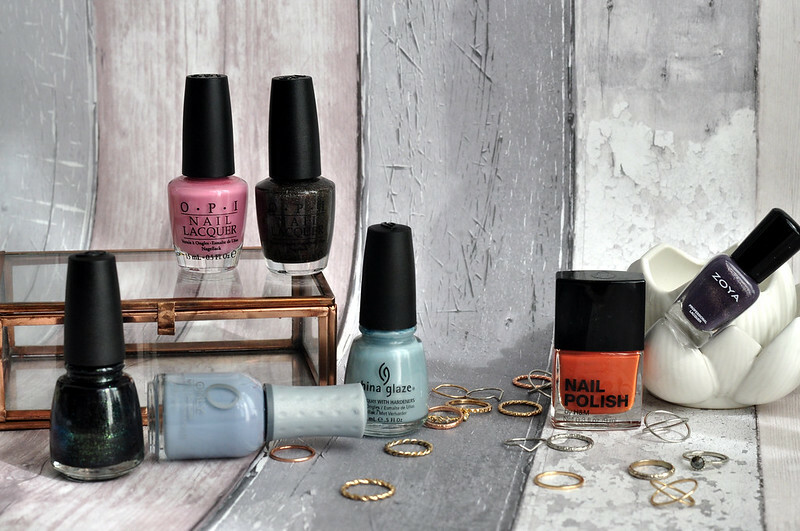 Seeing as the next Hunger Games film will be out soon, November I think, I thought it appropriate to include one of the polishes in my Autumn picks. My favourite out of the whole collection is Smoke And Ashes, a dark polish with bright glitter . Depending on the light, the glitter changes between blue, green and gold. A hard polish to photograph but it looks amazing in person when it catches the light. Swatch photos will be up on my blog over the next few weeks and I'll update the links in this post when they're live.